The Super Eagle has finally moved in with the Russian champions after his former club, now dissolved, were neck-deep in financial troubles. 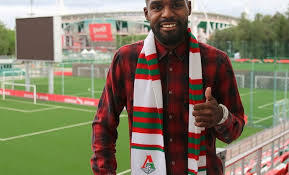 Lokomotiv Moscow have completed the signing of Brian Idowu as a free agent, after leaving Amkar Perm at the back of their financial problems. During the winter break, the Zvezda Stadion outfit reportedly ran out of cash and they had their 2018-19 Russian Premier League license revoked by the Russian Football Union, thus, leaving the 26-year-old wing-back clubless. Idowu who joined the Red and Blacks in 2010 will now begin a new chapter in his career after signing a three-year deal with the Russian top-flight champions. The defender will have the chance to participate in next season’s Uefa Champions League. The Saint Petersburg-born player represented Nigeria at the 2018 World Cup, playing in all three group games as the Super Eagles failed to make it past the preliminary stage.